Regardless if you are on four wheels or two, it is always important to know where you are going or how to get there. Far from being only for cars, there are many top quality GPS systems available for motorbike riders alike. 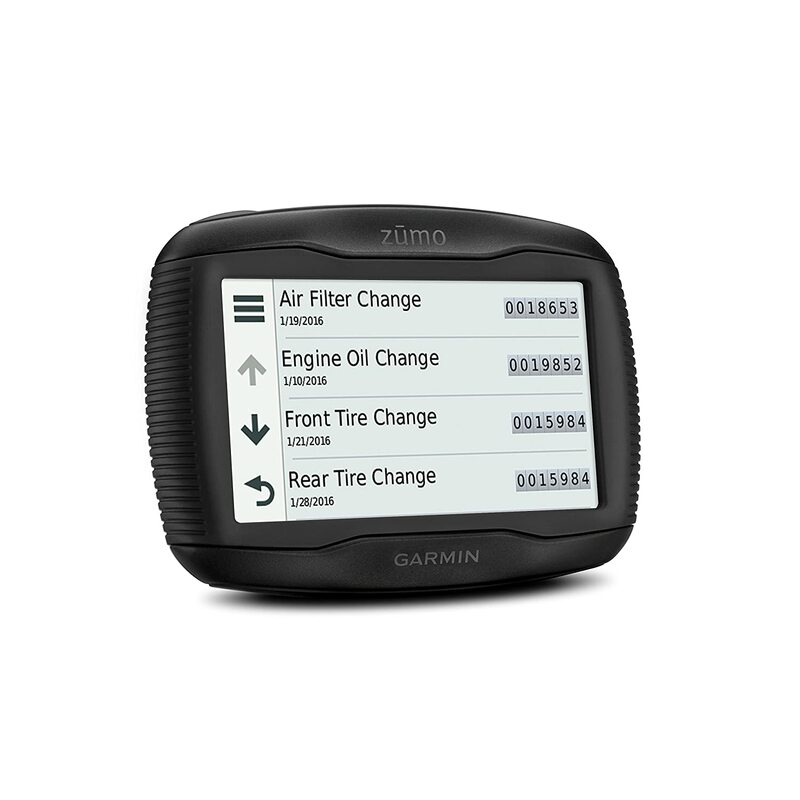 Of those, many come from Garmin which is a powerhouse in the navigation industry on a whole, but most certainly in terms of motorcycle GPS devices. A more moderate choice in comparison to the other flagship models from Garmin, the 590LM and 595LM, this one still packs a hefty bang for its buck with an abundance of great features to keep you on the right track in style. An upgraded follow on from the successful 390LM, this model provides the same, reliable, hardwearing exterior which not only look and feels the part in its hardy matte black, it also acts the part. The 395LM is largely weather resistant, enduring all conditions and most liquids thrown at it by an average biker. This includes water of course. The 395LM is certainly made of stern stuff. What else could we expect from the market leaders in motorcycle GPS. The tough and ready casing is home to a sleek 4.3” viewing screen which stands out in all conditions thanks to its high level of definition and glare resistance for those hotter than hot days out on the road. The slightly smaller screen size of the 395LM also need not be a drawback. It is all the easier carried when leaving your bike. The screen is also big enough that it can be easily interacted with, even when wearing cumbersome gloves. 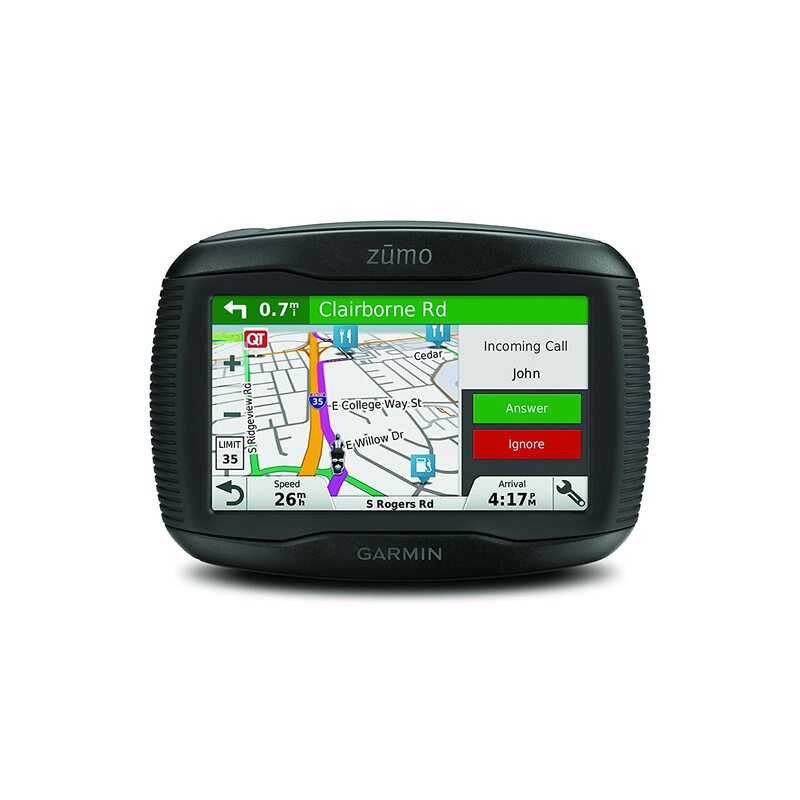 Unlike its loftier Garmin counterparts, this model is not compatible with the smartphone link app. However, don’t sweat. You can still establish a fantastic connection with your mobile devices using Bluetooth. This is a more than adequate option which means you will still be able to catch up on calls and listen to your favorite songs on-demand. This connection can also be used to receive communication from the “spoken directions” feature on the 395LM. This is highly convenient to avoid distractions while on the road and can also save you valuable time, presuming you have the correctly equipped helmet. A cornerstone feature of all the latest in the Zumo range is Adventurous Routing. This allows you to throw off the shackles that bind and let your hair down while accelerating into the distance. More specifically, this feature allows you to choose the exact type of route you want. This can be elevated, twisting, turning, whatever you feel like to help you have an exhilarating ride. The feature will then guide you on the best possible route to fit you desires. All the while, the system will also keep you fully informed of any impending dangers such as traffic lights, speed cameras or sharp turns. Using this feature is an experience that can impress even the most veteran of riders. Hence why it has become a key element within the Garmin Zumo range. The awesome dynamic fuel stop feature is another which greatly impresses users. This takes basically all of the worries right out of your mind and allows you to concentrate on taking in all of your surrounding and feel of the ride without having to be distracted. The feature tracks your fuel levels and consumption, mapping out and informing you of the most appropriate time and location for a fuel stop. All of this directly communicated your helmet with the correct accessories. 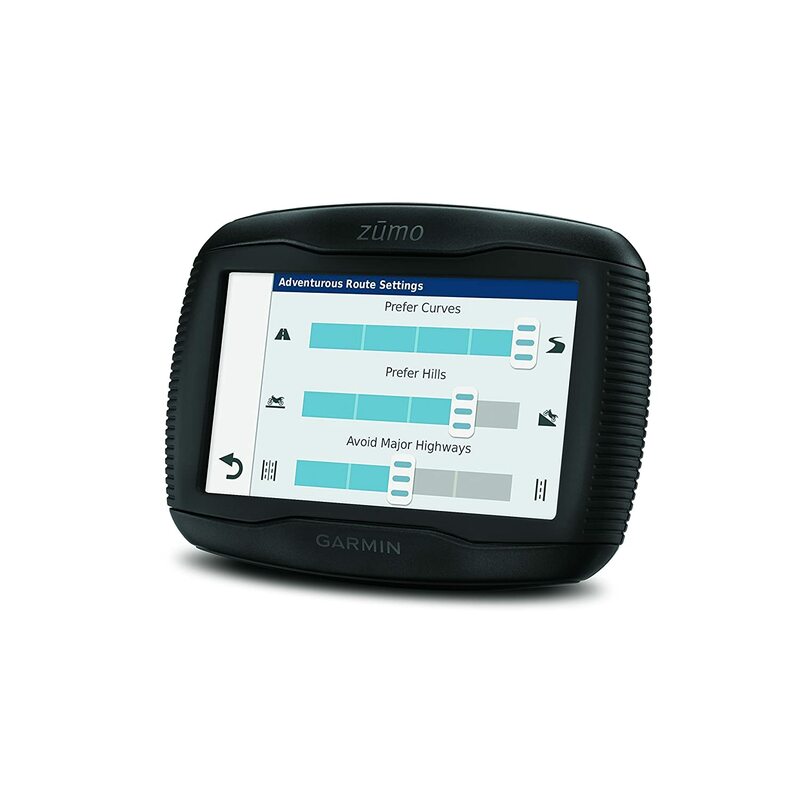 It certainly shows that the 395LM and the Zumo range as a whole are much more than simple GPS systems, they are dynamic devices in their own right. There is yet more. With the rider alerts feature, you can be warned of upcoming hazards and even of helmet regulation changes as you coast from state to state. This helps to eliminate any confusion and ultimately bad breaks which could otherwise lead to a penalty on your license. This is a real lifesaver to those long distance riders who just want to focus on the open road ahead. The service history log feature will also track the maintenance history of your bike. Not only will this feature help jog your memory about what has or needs to be taken care of on your machine, it can also serve as handy back-up to reinforce a future sale with an inquisitive buyer. A tire pressure monitoring feature is also available to help you keep a close check on tire condition and know when it is time to pull over or even identify any issues which may arise with slow punctures or other minor hiccups. Overall, the LM395 may not be the flagship, star-studded model of the range, it is however, still a fantastic piece of kit. Like all the others in the range, it comes jam packed with not only useful but innovative and groundbreaking features. With its steely and battle-ready exterior, knowledgeable and insightful features which will enhance your ride no end, this model is certainly no black sheep of the range. It stands confidently shoulder to shoulder with its awesome Garmin counterparts and still a good head and shoulders above many of the competitors. In terms of price, the 395LM also performs really well, coming in at a more moderate level than some of the other models, yet still keeping you pinned firmly in the right direction.